Omega Smart Hearts are treats you'll love to give your best friend. Made from NON-GMO, human grade stabilized ground whole flaxseed and fish oil. My name is Sean Moriarty and I have the privilege, along with my wife Brenda, of owning and operating Omega Fields. Maybe your experience in today's business world has been something like ours: sales people with little or no knowledge of their products, disinterested service providers, business owners telling you anything to get the sale and then disappearing when you need additional service or, God forbid, a refund! We are confident you'll love our products and we are determined to make your experience with Omega Fields a pleasant one. Whether you use our online ordering process, call our toll free order line or find our products at your local retailer, we want you to be able to enthusiastically recommend Omega Fields to your friends. As the manufacturer, product quality is our number one priority, as a product retailer, YOU are our number one priority. We promise to do everything possible to make your experience with Omega Fields positively memorable. Thank you for your business. Omega Fields® NEW Omega Smart Hearts formulated as a healthy balanced Omega-3-6-9 soft baked, heart shaped treat for all dogs. Made from NON-GMO, human grade stabilized ground whole flaxseed and fish oil. Flaxseed is the #1 ingredient and include synergistic plant and vitamin based antioxidants and cranberry fiber. Contains no Soy or Corn. Ordering is easy! 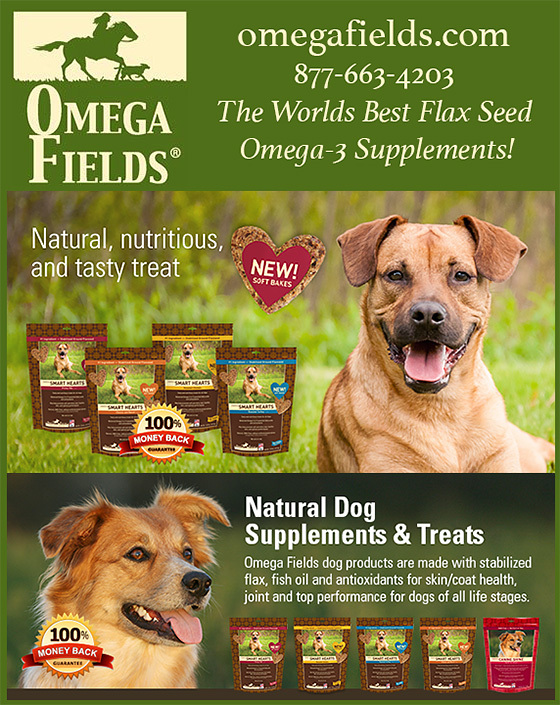 You have several options to order Omega Fields® premium products! You are welcome to call toll free (877-663-4203), or go to your local store, now carrying our products! We have numerous dealers including PBS Animal Health, HorseHealthUSA, Hubba, and more!